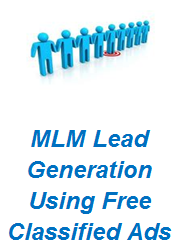 MLM Lead Generation Using Free Classified Ads is actually a tricky deal these days. You see - too many Network Marketers and MLM'ers have no clue on how to get leads. And basically they throw their opportunity in the faces of their prospects. And I am pretty sure that you know what I'm talking about. I'm also pretty sure that you think of it just like most of us do. Because most of us think that it's repulsive! And that's one of the problems that we face when using free classified ad services. They think that it is totally spammy - and repulsive. And they don't want that junk all over THEIR website pages! And that result's in more restrictive rules - when it comes to MLM, Network Marketing - and now even Affiliate Marketing. So all of those people who blast those ridiculous income claims - and the fast money claims - have now ruined it for everyone. Now today if you try to use Craigslist for MLM Lead Generation - forget it! They will either refuse your ad right up front - or - as soon as it is reviewed it will be taken down. In fact in their terms and conditions of use - it's now banned! And now Back Page is starting to implement the same type of restrictions, so I imagine that it will become almost impossible with them soon as well. So - how do we promote our opportunity on these free classified ad sites now? MLM Lead Generation Through Value! So the first thing that we need to do is stop throwing our opportunity into other peoples faces. Why? Well it doesn't work first of all. It actually chases people away! So stop it! What we need to do - is share value with like minded people. And when you do that - you attract people to you. Yeah I know - it sounds like a weird concept. But as soon as you stop treating people like a commission - they tend to treat you like a friend instead. LOL - go figure! Give them value.....share something that has helped you. Teach them some of the things that you have learned! And now take that concept - and publicize it on the free classified ad services! Make a video that you can give away for free on an ad site. (Or anywhere for that matter!) But make it of some value! Make it something that could actually help people! So - now we can put that out there on Craigslist and Back Page - and if we watch how we word it - it is no longer an MLM, Network Marketing or Affiliate Marketing opportunity! Now - be cautious about this because no one likes you coming along and taking their visitors away from their site. That goes for YouTube, Facebook, Google+, and yes - Craigslist and Back Page! Actually Craigslist forbids you to put links in your ads - that re-direct the traffic to your own site. And - Back Page still allows it - but I know they don't like it. And I say that Craigslist forbids it - but you might get away with it for a short period of time. In fact your ad can be posted.....and then mysteriously it disappears a couple or a few days later. So here are a couple of tips for you - to help you become dumb like Fox. #1 - get the visitor to respond via email and then email them the link. Now understand - the only thing they will be looking for is the link - so don't spam them! Just give them the link - and that's it! #2 - post a picture and at the bottom of the picture - insert your link. NOT a live link! But something short that is easy to type in to the URL address bar. For example - sometimes I use http://DJWAA.net as a short link that re-directs back to this site. People have no idea what the DJWAA stands for - but it must be a real site right? But the point is that it's short and can easily be typed in by the people who see your ad. And it doesn't scream out - hey this is about MLM!!!! #3 - Don't make it related to MLM, Network Marketing or Affiliate Marketing at all. Make it generic home business related or specific to sales leads or something that is not banned. And DON'T put it in the employment section. That can really get you nailed legally! Now I know that Craigslist gets more visitors than Back Page - but I can get a little more favorable perks by using Back Page. First of all - they are not as restrictive as Craigslist. And my ads stay visible longer then they do in Craigslist. In fact I find way too many tire kickers on Craigslist. So I have been sticking with Back Page. Anyway - you can post ads in several cities at a time and if you use different titles and even switch up email accounts - you can post in quite a few cities. You see I post my ads in over 500 cities - all around the world. In fact it's actually about 550 cities. And I do mean all over the world. In Europe, Australia, the Caribbean, Malaysia.....and of course - all around the USA. But any way that you slice it - it's all over the place! And although Back Page is free - I use a service that my friend offers - and he gets me into all of those cities. It;s called Classified Submissions. So - he does all of that work for me. And that's cool because posting ads in 550 cities would take me weeks of work - and I am just not into that. Now he does charge a small monthly fee to do that - and to keep it going every month for me - but there is a catch. And it's a good catch for me and people like me. You see he's an online marketer and he understands affiliate marketing. So he offers an affiliate marketing program for his ad service. AND - he pays out 50% commission. So what I did was I made one blog post, one article and one YouTube video about his service - and I have made hundreds of dollars in commissions. So even though I cheat a little and use free ad sites - through a paid service - well I really don't pay for it anyway. The commissions that I have made - pay for my ads many, many times over. In fact anything that I make in commissions with - like this service - I just re invest right back into more ads. I mean why not - it's basically free money - and free ads. Now you night ask - yeah but how exactly are you using Back Page for MLM Lead Generation - and does it work? Well I'm sure that you are curious about how I use Back Page so I'll show you my latest campaign as an example. Now remember I said that we should offer some value. You know - teach your prospects something that you have learned. Well I decided that I would show them my #1 Strategy On How To Build A Large MLM Business. Now I really didn't want to release this - but my team sort of encouraged me and I ended up doing it. And then about two weeks I got a call from someone that made me decide to just leave it out there - and just give it away. This guy called and said - "hey Dave - I'm at 170 degrees - and I love your strategy! In fact - I invited some friends over to the house - put your strategy video up on the wide screen and they loved it. And then they ALL joined my MLM - just like you taught on that strategy. And now I'm at 170 degrees"! Well that changed it for me - and I decided to keep it out there. So I put up a test ad on Back Page to make sure my tracking links worked - and to see what kind of a response I would get on Back Page. Now - I put this up late at night and on a Sunday night to boot. And within an hour - I knew I would run an ad campaign with it. Now remember this was just a test and it was really just to see if the tracking worked properly. I did that because Back Page disables most tracking codes - and bans short links. But my tracking link is on my own domain - which is hosted on the marketing platform that I use. And it worked like a champ! Anyway - look at the leads column. Now with only 31 unique visitors - I got 17 leads! That's over 54% conversion!!!! Now remember this was posted late at night and by morning was already sliding down the page. And - it's only in for a week so far - and only in one city. What will happen when it goes up in 550 cities? Now obviously the numbers are low - because we want thousands of views right? Right! But this is free for me and I only did this as a test and I posted it late at night. I knew that I was going to post it in 550 cities - and I purposely worded this ad really low key - because I did not want it to stand out - when my real ad hits this same city. But the conversion rate shocked me. So what did the ad look like. Well.......I'm not going to show you everything LOL! But all I did was post a picture and a title. So the picture mentions MLM - but the title DOES NOT! So the ad itself is simple. I make an image - and I insert one or two sentences only, that offer 3 free videos. And My #1 Strategy On How To Build A Large MLM Business is the focal point. It's just value - and fixes the biggest problem with MLM. Now on Back Page - at this time anyway - we are still allowed to use links. And - I do link this particular ad to my personal blog. But I am sure that in the near future we will not be able to do that. And at that time - well we will have to offer even more value - and get the visitors to reply via email to obtain the link. Anyway - this is just an example of how I use free classified ads for MLM Lead Generation. And I just submitted this particular campaign to my buddy last night. And I am thinking that I may just post the results of this campaign - with the actual results - some where below in a month or two. So you can still use Craigslist - but you have got to offer value. And you have to be dumb like Fox when running an ad. But - you have to do all of the work when thinking of running an ad in more than one city. You can also use Back Page and have a little more lee way when it comes to the use of the words MLM, Network Marketing and Affiliate Marketing - but I personally avoid them. But if you do choose to use Back Page as an option - you really should look at Matt's service. At least take a look! And if you wanted to try his service - by all means sign up as an affiliate because it's free to join. And - you get 50% commissions! So if anyone in your team tries it - or if you promote it a few times here and there - all of your ads could be totally free.....every single month. Oh - and check out what he just did for me. Well actually he does it for everyone - but I thought it was a pretty cool little perk. You see he made a small promo video and then he put it on his YouTube account, his Facebook Fan Page and even on Twitter. So it's just one more thing that he does to get us more traffic - to our ads. So next time you consider MLM Lead Generation Using Free Classified Ads - also consider Classified Submissions! I wish you the very best of success in your business! Copyright 2014 D.J. Webber & Associates - All Rights Reserved . Picture Window theme. Theme images by enot-poloskun. Powered by Blogger.